There are two places to whale watch from the Pacific Rim. Launching from Tofino takes you into Clayoquot Sound. 35 minutes to the south is Ucluelet and Barkley Sound. Both places can have good whale watching depending on the time of year. 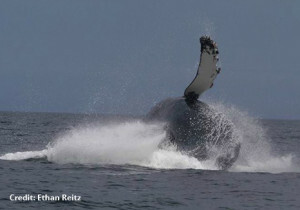 Most common whales here: Humpback (May to September) and Gray Whales (March to November). During September of 2014 there were some resident Orcas that hung around for a couple weeks. In 2016 we saw some Transient Orcas pass through, however they only come randomly so it is not something you could expect to see. 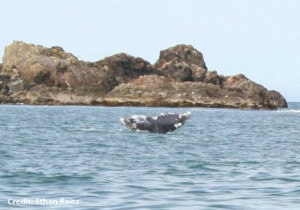 From March to mid April up to 19,000 Gray Whales migrate past the Pacific Rim and every year a few stay around Barkley Sound (between Bamfield and Ucluelet) and in Clayoquot Sound (Tofino). 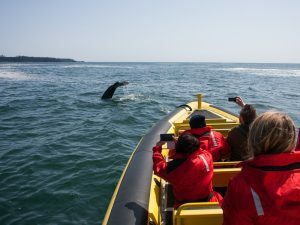 Humpback Whales can be seen during summer months anywhere within 30 miles off shore and larger groups of them may be spotted while on fishing trips out of Ucluelet, Bamfield or Tofino. 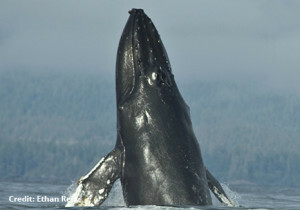 Humpback whales will feed in the inlets and it is possible to see them in Barkley and Clayquot sound. Bringing you closer to nature & the Pacific Ocean, Ocean Outfitters is the perfect place to start all of your Tofino activities! Board one of our 30′ rigid-hull inflatable zodiacs, or one of our high-speed covered family cruisers to enjoy some of the most spectacular scenery in the world! This rich and nutrient filled ocean is loaded with a variety of marine wildlife including many different species of whales; as well as harbour seals, sealions, sea otters, porpoises and a myriad of birdlife including puffins, blue herons and bald eagles. Our programs are not only a ton of fun, but they also encourage stewardship. We care about science and education. After joining us, we hope that people see things a little differently and maybe make better choices.